class 12 commerce economics notes:- Economics is one of the social sciences, which has great influence on every human being. As economic life and the economy go through changes, the need to ground education becomes essential. While doing so, it is imperative to provide them opportunities to acquire analytical skills to observe and understand the economic realities. It is at this stage, the learners are exposed to the rigour of the discipline of economics in a systematic way. 1. Definition It is a branch of economics that studies the economic variables at an individual level like the households, the firms, the consumers etc. It is a branch of economics that studies the economic variables of an economy as a whole. 3. Deals with It deals with how consumers or the producers make decisions depending on their given budget and other variables. It deals with how different economic sectors like households, industries and other government and foreign sectors make their decisions. 4 Method The method of partial equilibrium (i.e. equilibrium in one market) is used. The method of general equilibrium (i.e. equilibrium in all the markets, simultaneously) is used. 4. Variables The major variables involved are price, consumer’s demand, wages, rent, profit, firm’s revenue, cost, etc. The major variables involved are aggregate demand, aggregate supply, inflation, unemployment, poverty, etc. This economy is also called `laissez faire‘. It has minimum interference or restriction from the government. What are the four factors of production and what are the remunerations to each of these called? 1. Land – It denotes the natural resources like air, water, soil, etc. The payment that is paid by the firms to acquire these services is called rent. 2.Labour – It refers to the physical and mental effort required to do a work. For example, engineer, manager, worker, etc. The payment made to the labour in exchange of his/her services is called as wage. 3. Capital – It refers to the monetary investments and physical and tangible investments like machinery, buildings, technology, tools, etc, which assists in production process. The payment received in exchange of these services is called interest. 4. Entrepreneur – It refers to the individual who undertakes the risk to organise the production process. Entrepreneurs are the risk takers and often are the innovators of new techniques. They receive profit in exchange of their entrepreneurship. The remunerations paid to the factors of productions are called factor payments or factor incomes. These are the aggregation of rent, wage, interest and profit. Why should the aggregate final expenditure of an economy be equal to the aggregate factor payments? Explain. In a two sector economy, consisting of households and firms, the only way in which the households can dispose their income is on the goods and services produced by the firms. The factors of production use their remuneration to purchase goods and services. Thus, the income will come back to the producers in the form of sales’ revenue. So, there is no difference between the amount that firms distribute in the form of factor payments and consumption expenditure incurred by the households. The same process continues year after year. However, if there has been any leakage in the form of savings, imports or taxes, then there arises a difference between the aggregate consumption expenditure and aggregate factor payments. In the case of some leakage, the households will spend less than their factor incomes. Consequently, the firms will receive lesser amount in the form of revenue, which will reduce the production level and employment level. This process will continue in every successive round and production and employment levels will continue to drop. Thus, the equality between the aggregate consumption expenditure and the aggregate factor payments is very necessary for the smooth functioning of the economy. What is a barter system? What are its drawbacks? Barter system is a system that was used in ancient times to exchange goods. In other words, this system was used to exchange one commodity for another before the monetary system came into existence. For example, if a person having rice wants tea, then he can exchange rice with a person who has tea and needs rice. The economy having the barter system was called ‘C-C economy’, i.e. commodity is exchanged for commodity. Double coincidence of wants implies that needs of two individuals should complement each other for the exchange to take place. For example, in the above case, the second person must need rice in exchange of tea. Under barter system there was no common unit for measuring the value of one good in terms of the other good for the purpose of exchange. For example, a horse cannot be measured in terms of rice in the case of exchange between rice and horse. It was very difficult to store commodities for future exchange purposes. The perishable goods like grains, milk and meat could not be stored to exchange goods in future. Therefore, wealth storage was a major difficulty of batter system. The future payments could not be met in a C-C economy (barter system) as wealth could not be stored. It was very difficult to pay back loans. What are the main functions of money? How does money overcome the shortcomings of a barter system? Money acts as a medium of exchange as it facilitates exchange through a common medium, i.e. currency. In other words, money helps in the buying and selling of goods. For example, a person can sell his goods to another for money and that person can use money to purchase goods of his choice. Money solves the problem of double coincidence of wants. The values of goods can be measured in terms of money. It is a common medium through which we can calculate the value of each and every good. The value of a good in terms of money is called the price. In barter system the lack of a common denominator for measuring values of goods was a major drawback. This function explains the importance of money as value storage. This implies that wealth in the form of money can be stored easily as a medium of exchange for future use. For example, money can be stored in banks for meeting emergency and future needs. Payments can easily be made through the medium of money. In other words, it is very difficult to pay back a loan in terms of goods and services. However, with the advent of money the payments of loans or interests can easily be made. 1. Money solves the problem of double coincidence of wants. For example, if a person needs wheat in exchange of tea, then he/she must search for a person who is ready to trade wheat for tea. Money made the need for such searches redundant. 2. In barter system, it was very difficult to measure the value of one good in terms of another. For example, it is difficult to calculate the value of a cow in terms of wheat. 3. It was very difficult to store goods, especially perishable goods (fruits, meat, etc.) for the purpose of value storage. Money serves this purpose. 4. The contractual or future payments are much difficult to be made in barter system. For example, a worker working on contract basis could not be paid in terms of rice or chairs. What is marginal propensity to consume? How is it related to marginal propensity to save? Marginal propensity to consume refers to the ratio of change in the consumer’s expenditure due to the change in disposable income (income after deducting taxes). In other words, MPC measures how consumption will vary with the change in income. For example, if income increases from Rs 200 crores to Rs 250 crores and consumption increases from Rs 20 crores to Rs 40 crores, it implies that 0.4 is the MPC or 40% increase in the income is being consumed. This can further be explained with the help of a table and a diagram. Also, MPC can be explained with the given diagram. 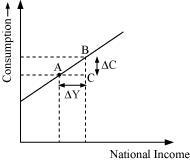 In the diagram, x-axis represents national income and y-axis represents consumption level. So, the sum of MPC and MPS is always equal to unity. What is the difference between ex ante investment and ex post investment? It refers to the planned or intended investment during a particular period of time. It refers to the actual level of investment during a particular period of time. It is imaginary (intended), in which a firm assumes the level of investment on its own. It is factual or original that signifies the existing investment of a particular time. It is planned on the basis of future expectations. It is the actual result of variables. Explain why public goods must be provided by the government. A good that is non-rival and non-excludable is referred to as public good. Non-rival means that consumption by one individual does not affect the consumption of another individual. Whereas, non-excludable implies that no individual can be excluded from using the good. For example, parks, roads, national defence, etc. 1. The benefits of public goods can be easily enjoyed by anyone without affecting the consumption of other individuals. There arises market failure. 2. No individual can be excluded from using public goods as it is available to all. The link between the producer and the consumer becomes non-functional, necessitating government interference through public provisions. Distinguish between revenue expenditure and capital expenditure. Creation of Assets It does not create assets for the government. It results in the creation of assets. Reduction of Liability These expenditures do not result in the reduction of liability. These expenditures cause a reduction of the liability of the government. (b) Expenditure on land, building, etc. Definition It is the difference between the values of exports and imports of goods of a country. It is the difference between the values of exports and imports of goods, services and unilateral transfers of a country. 2. Import of goods Export and import of goods, export and import of services, unilateral transfers. Nature of transactions It records transactions related to visible items (i.e. goods) only. It records the transactions related to visible items (goods) as well as invisible items (services) and unilateral transfers. The transactions carried by monetary authority of a country, which cause changes in official reserves, are termed as official reserve transactions (ORT). These transactions are carried through purchase or sale of currency in the exchange market for foreign currencies or other assets. The reserves are drawn by selling foreign currencies in exchange market during deficits and foreign currencies are purchased during surplus. When the official reserves increases or decreases, it is called overall balance of payments surplus or deficit respectively. 1. Purchase of a country’s own currency is a credit item in the balance of payments; whereas, sale of the currency is a debit item. 2. It helps to adjust the deficit and surplus in balance of payments.